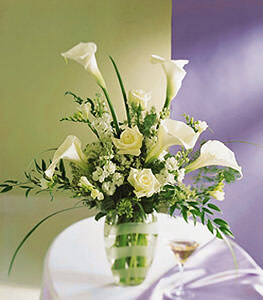 This striking white arrangement features an assortment of elegant flowers-- white calla lilies, white roses, white stock and more--artfully arranged in a glass vase. Vase may vary from item pictured. Note: This item may require 24+ hours notice in some areas.